Like to keep things laid back and easy? Take a stroll in the Mens Port Lincoln Jacket . Inspired by the classic biker jacket, this travel jacket is both casual and functional. The feel is light and natural, so it's super comfortable to wear when you're off exploring new cities and new countries, and is equally good for everyday use. It is made of wind and water resistant Function 65 Ecosphere Wax, a blend of organic cotton and recycled polyester. The special thing about this fabric is the waxed finish. It gives the fabric a slightly stiffer feel and develops its own unique patina over time. It also means you can take a leisurely approach to light showers and windy weather. 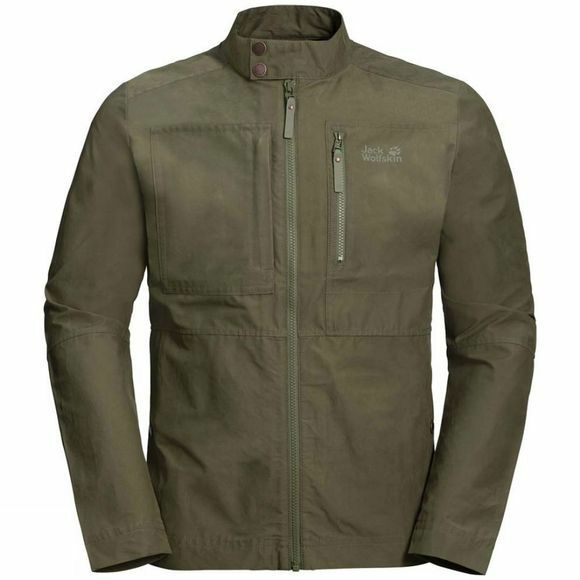 The jacket is equipped with four pockets for your valuables or other small items.